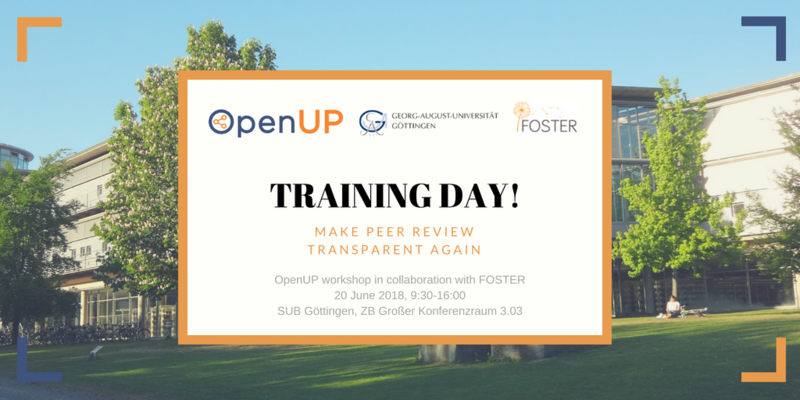 OpenUP is pleased to open registration for the OpenUP training workshop “Make peer review transparent again”, hosted in collaboration with FOSTER, to be held in Gottingen on 20th June 2018. The training workshop focuses on the changing discourse of peer review, the strengthening presence of open peer review in scholarly publishing, and the emerging methods and tools in support of open scholarship. The workshop wishes to provide young researchers with information about the methods and tools of open scholarship, open peer review in particular, to strengthen core principles of research integrity. It also plans to engage a wider research community in a dialogue about open peer review and some of the major aspects of the transforming scholarly publishing system (demand for greater transparency, erosion of incentives, lack of training). Places are limited to a maximum number of 25 participants.